The exhibition Angels Sleeping is a thematic cross-section, predominantly of the painting work of the Austrian artist Gottfried Helnwein (born in Vienna in 1948). The five sections of the exhibition present the fundamental circuits of Helnwein's work. The introduction comprises heads - faces, including the artist's iconic self-portrait, painfully acute metaphors of the limits on freedom of expression in Austria in the 1970s and 80s. The artist's merciless approach to the residues of the Nazi past of his country is a further theme, developed in monochrome, hyperrealistic painting. The central and still extremely relevant theme of Helnwein's work however is das malträtierte Kind, the child exposed to suffering. The author engages with this theme in various positions from his early works from the 1970s up to the present day. His collection of works on this theme is given the largest space. Violence committed against children, in contrast with their passive exposure, distressed astonishment and impossibility of defending themselves against the world of adults is partially shifted into a further position, ironically entitled Art in Amerika. This presents the relationships of the white, frequently uniformed “majority” to other ethnic groups and minorities, particularly in the United States, sharpened by the photographic precision of the images. 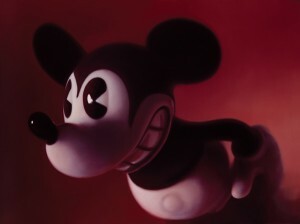 The final chapter, presenting metaphorical portraits of the punk singer Marilyn Manson, oscillating from the black and white tones of Mickey Mouse and paraphrased gestures of saints to demonic masks, flexibly documents the dark side of humanity on the face of the media star in large format photographs.